A seven-year study of marked plants and plots in Stipagrostis ciliata (Desf.) de Winter dune grassland, in the arid (<100 mm yr−1) Bushmanland area of the Northern Cape province of South Africa, was designed to test the hypothesis that establishment of ephemeral plants, and recruitment of perennial grasses was dependent upon disturbances that reduced the density of living perennial grass tussocks. In 1989, eight 4 m2 plots were cleared of perennial vegetation by uprooting and removing all plants so as to resemble small-scale disturbances made by burrowing mammals or territorial antelope. The vegetation on the cleared plots and surroundings was monitored until 1996. Initial results supported our hypothesis. In wet years, when ephemeral plants were abundant, their average fresh mass was 2–3 times greater per unit area on the cleared plots than in control plots in adjacent, undisturbed grassland. Many Stipagrostis seedlings established in the cleared plots over the two years following clearing but were rare in adjacent areas among established conspecifics. However, a drought in 1992 (11 mm of rain over 12 months) lead to widespread mortality of the perennial grass, killing 56% (range 22–79%) of established tufts. High densities of Stipagrostis seedlings appeared following the drought-breaking rains in January 1993, both in the disturbed plots and in the surrounding `undisturbed' dune grassland. Ephemeral plants established in large numbers throughout the area during the high rainfall year of 1996 and were generally more numerous in the old disturbances than in control plots. Seven years after clearing the biomass of grass on the cleared plots was approximately 34% of the mass removed from the plots in 1989 whereas in the undisturbed grassland biomass was 66% of 1989 levels. 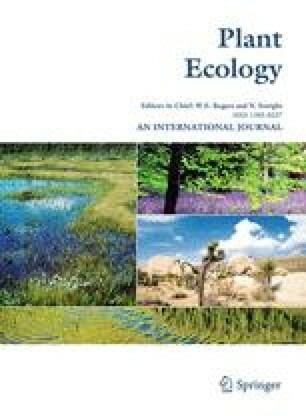 Drought had little long-term effect on community composition, and Stipagrostis ciliata constituted 94–98% of plant community before and after drought. Cleared plots were recolonised by S. ciliata, but the contribution of other grass species increased by 6–9%. Synchronous recruitment following occasional drought-induced mortality can generate even-aged populations of the dominant desert dune grasses.